In the Fall of 2016, PCCLD began a new partnership with Colorado State University- Pueblo that established the Library @ the U location on the first floor lobby of the Library and Academic Resources Center (LARC) along with a host of new services to campus users. 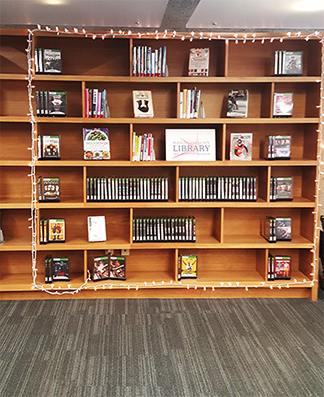 As part of the agreement with the University, PCCLD provides a variety of adult fiction and non-fiction books and DVDs that will rotate on a monthly basis and will be available for checkout at the LARC. PCCLD books placed on hold from other PCCLD locations or online may now be delivered and picked up at the University Library. CSU-P students and staff will be able to sign up for a library card and check out materials at any library location. The campus community also will have access to PCCLD digital services, including Cloud, Hoopla, Freading, and Freegal. This collaboration brings PCCLD one step closer of the district's goal of creating community partnerships.